Mayan archaeology in the perspective of art, iconography, epigraphy, architecture, Mayan languages, religion including resources for students and scholars, plus photos for visitors to Guatemala, Belize, Mexico, and Honduras. What in the world is malaquet? Is malaquet an edible fruit or other plant part missing from 95% of all lists of edible plants of the ancient Mayan people? Is malaquet a medicinal plant which should be added to the over 450 medicinal plants of the Mayan peoples? (actual count is more probably between 500 and 600 plants). The malaquet trees that we have found in two locations of Alta Verapaz should bloom by the end of this month and/or in May. As soon as we have photos we will be able to document that it is probably Xylopia frutescens and not Xylopia aromatica. Then we will update our web sites and prepare a FLAAR report on potential uses of Xylopia frutescens. 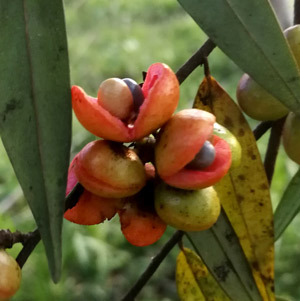 Malaquet fruits, probably Xylopia frutescens, photo courtesy of plant scout Don Chus. Malaquet fruits showing seeds, probably Xylopia frutescens, photo courtesy of plant scout Don Chus. We also have documentation that the bark of Xylopia frutescens trees can be used to make string or rope. And the wood is used in house construction. 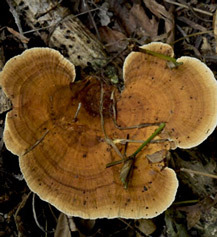 Did the Maya use Lichen and Mushrooms as a source of dye colorants? The Parque Nacional Yaxha Nakum Naranjo administrators realized that the park has a lot more than monumental architecture, so the FLAAR Mesoamerica team is working together with the park administrators to find all edible plants and all usable plants (and lichens and mushrooms, which technically are different than "plants"). One discovery of the FLAAR research team is that several mushrooms and at least one lichen can produce viable dye colorants. Turns out that one of these mushrooms is the most common large mushroom in the park. 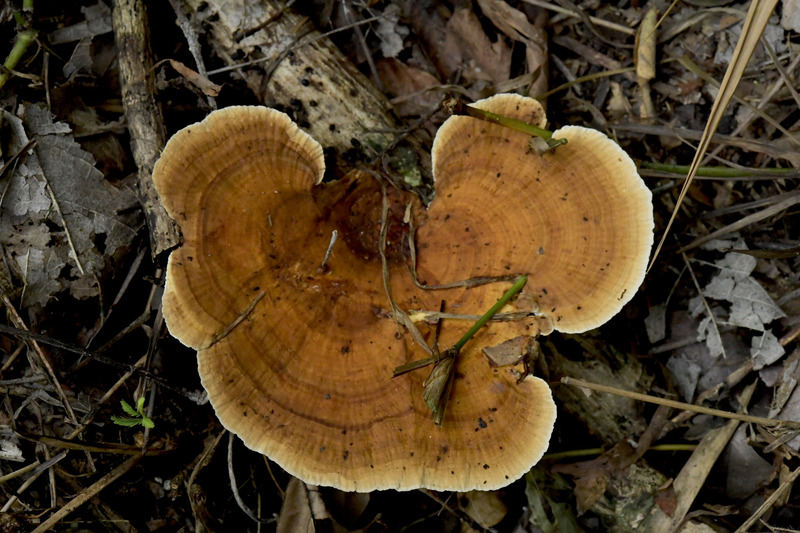 Elena Siekavizza, plant researcher at FLAAR Mesoamerica, found 48 Peten-area mushrooms that can produce dye colorants. 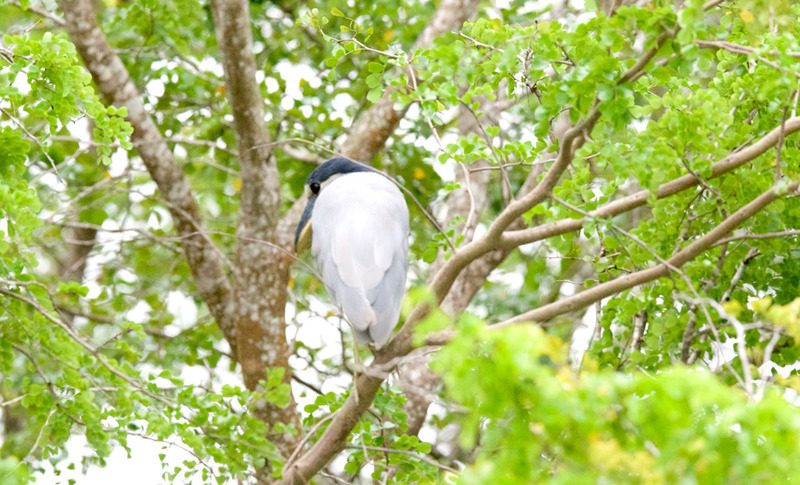 Of these we have already located about a dozen at the Yaxha park. So there really is a lot to see, experience, and learn about at the park (in addition to pyramids, palaces, temples, acropolises, plazas, and causeways). The FLAAR team has found 20 species of lichen which provide colorants that potentially can be found at Yaxha. It would help if an individual or foundation or company could donate a good pair of binoculars and a quality digiscope so we can find and then photograph these lichens. Whereas most mushrooms are on the ground, many lichens are high up in the treetops. If you can donate the binoculars and a Swarovski or Zeiss digiscope with connectors to one of our cameras (we have both Nikon D5 and Canon EOS 1DX Mark II) you can accompany a future field trip (you, your family, friends). This equipment is also helpful for studying orchids, bromeliads, and birds of the Neotropical rain forests. Or if you can’t get to the park, you can fly Dr Hellmuth to give a lecture in your hometown anywhere in the world: at a local museum, local university, local social club, at your company, etc. Contact: frontdesk symbol FLAAR.org We assume you know how to create a viable e-mail from this. 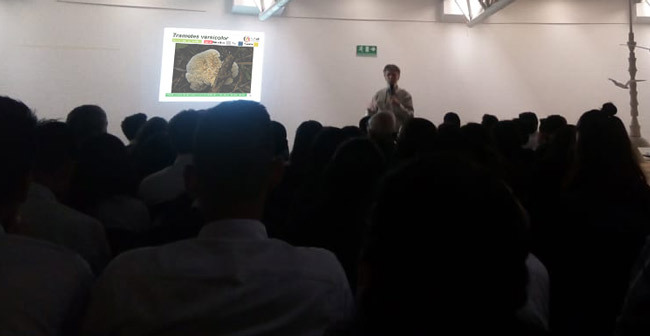 Dr Hellmuth presented the discoveries of which species can produce dye colorants on April 2, 2019, 10 am (to 11 am), Museo Ixchel on campus of UFM, Zona 10, Guatemala City. The lecture shows lots of the trees and plants at Yaxha which can produce colorants (including trees not yet in any book on Mayan colorants of Guatemala). If you are in another part of the world, the FLAAR team has lots of potential lecture topics for your university, museum, or organization. This lecture is available in English, Spanish, German, or your simultaneously translated language of preference. During February's second week, the FLAAR Mesoamerica team went back to Parque Nacional Yaxha Nakum Naranjo, with the goal to keep photographing and studying the flora and fauna of this impressive park. From analyzing aerial photographs (Instituto Geografico Nacional) the week before the field trip, Nicholas had noted a large area (over a square kilometer) with almost no trees. But it was natural (in other words, the trees were not missing because squatters had chopped them down). Lots of plants out there: but only specific kinds that survive a savanna ecosystem: so far we have found calabash trees and palmetto palms; we expect to find nance trees when we can return to dedicate more time. 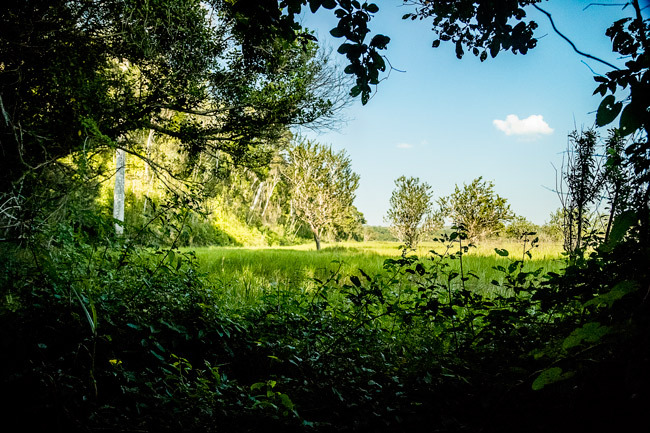 Our initial goal was to make this unprecedented discovery of a pristine savanna: not a Belize savanna; not a Poptun savanna; not a La Libertad or south-of-Lake-Petén-Itza-savanna: this is a savanna of Parque Nacional Yaxha Nakum Naranjo, a park administered by IDAEN + CONAP and with help of the park rangers. Lots of Mayan mounds buried under trees and vines on the hill overlooking the savanna. Taken with a Canon EOS-1D X Mark II camera; lens is a Canon EF 24-105mm f/4.0 L IS USM; settings: f/4, speed 1/8000, ISO 10000. Photo by Alejandra Gutiérrez, February 18, 2019. With the help of the IDAEH-CONAP team the FLAAR Mesoamerica researchers were able to follow a narrow trail through the rain forest to hike 5 to 6 km from Nakum. What we found is known as "La Sabana" by the park rangers. We are calling it “East-of-Nakum-Savanna” to help people find it on Google maps and the maps of the Instituto Geografico Nacional. On the printed maps it is shown with the symbols that document an occasionally wet savanna (it would be wet in a really rainy year; 2018 was a dry year so in February it was rather dry, yet you note from the photo that everything is green). It is crucial to learn about every single different eco-system in PNYNN because if LiDAR suggests there were “millions of Mayan people” then how did this large population utilize the savannas and bajo ecosystems? Our goal is to find all the various ecosystems, describe them, and document their potential for further research by universities and research institutes. The ancient Mayan city of Nakum is worth visiting, so we present some views of the temples and palaces here. FLAAR focuses on high resolution and innovative photography of archaeology, plants, and animals of Mesoamerica. We have experience all around the world but our center of interest is the Mayan civilization. The Parque Nacional Yaxha Nakum Naranjo asked if we could bring our equipment and our team to the park to take better photos so that people around the world could see what the park offers. Plus of course we all wish to document the Mayan heritage with innovative photography. Paulo Nunez and Juan Pablo Fumagalli spent the day doing panorama photography in the Acropolis and plazas of Nakum while the rest of the team hiked to an undocumented savanna eco-system many hours away. This is a normal pano, with the (Google Pixel 3 XL) telephone held vertically. The iPhone Xs can do this kind of pano equally easily. This photograph shows that the Google Pixel 3 XL can do two rows of photos whole creating a panorama. We do not yet know of an automatic way for our iPhone Xs to do this double row. Since we do not have a Huawei Mate 20, we do not yet know whether this impressive phone-camera can do two rows or not. We are looking at one of the Osmo systems to see if they can do multiple rows. The GigaPan can do a dozen rows, but that company went bankrupt in 2013 plus the camera is very heavy and the system does not itself do the stitching. But the GigaPan does offer significantly higher resolution since you can use a DSLR camera. We will be bringing you pano photos of the pyramids, plazas, and acropolises of Yaxha during March, so please come back to visit this web site. Later in the summer we will coordinate with archaeologist Vilma Fialko and architect Raul Noriega to do pano photography of their excavations and restorations at the monumental Mayan city of Naranjo (the eastern part of the Yaxha park). We will also do immersive panos of the remarkable corozo palm forest surrounding Naranjo ruins plus an awesome bajo-like area about 2 km long by almost 1 km wide which is a 20 minute hike from Naranjo center. Parque Nacional Yaxha Nakum Naranjo is administrated by capable teams of IDAEH and CONAP. We are looking at one of the Osmo systems to see if they can do multiple rows. The GigaPan can do a dozen rows, but that company went bankrupt in 2013 plus the camera is very heavy and the system does not itself do the stitching. But the GigaPan does offer significantly higher resolution since you can use a DSLR camera. We will be bringing you pano photos of the pyramids, plazas, and acropolises of Yaxha during March, so please come back to visit this web site. Later in the summer we will coordinate with archaeologist Vilma Fialko and architect Raul Noriega to do pano photography of their excavations and restorations at the monumental Mayan city of Naranjo (the eastern part of the Yaxha park). We will also do immersive panos of the remarkable corozo palm forest surrounding Naranjo ruins plus an awesome bajo-like area about 2 km long by almost 1 km wide which is a 20 minute hike from Naranjo center. Parque Nacional Yaxha Nakum Naranjo is administrated by capable teams of IDAEH and CONAP. Wild begonia in Mayan rain forest is an edible plant? Last week we were surprised to find white-flowered wild begonia plants in a bog-like wet area filled with tree-sized Acrostichum danaeifolium ferns. This wet muddy area was constructed by the Classic Maya less than a kilometer from Poza Maya, a satellite site of Yaxha (Peten, Guatemala). You can see this Mayan-enhanced rectangular “aguadas” area north of Yaxha on Google maps (satellite view). All the park rangers told me that their parents and grandparents ate the fresh stems of this begonia. 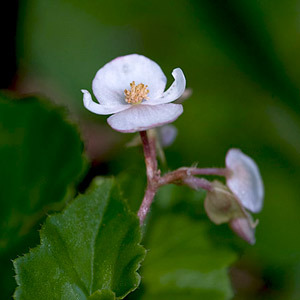 But so far I have not (yet) found begonias in lists of edible foods: begonia is missing from my Mayan food plants list and missing from that of Lundell (1938). I bet begonias are missing from 80% of lists of edible foods for the Mayan people, including in helpful botanical monographs on plants of the Mayan areas. But if you spend an hour searching, you gradually learn that many species of begonia are indeed eaten in parts of Mesoamerica. 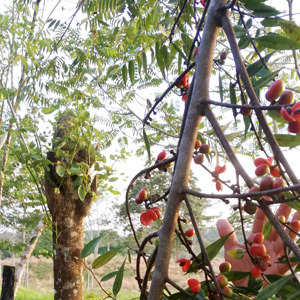 Our inspiration at FLAAR (USA) and FLAAR Mesoamerica (Guatemala) are to bring back the healthy edible plants which are native to the diverse ecosystems of Guatemala, Belize, Mexico, Honduras, and El Salvador. So today we resurrect the begonia. We will identify the species from Parque Nacional Yaxha Nakum Naranjo as soon as possible. We thank the park ranger Teco (Moises Daniel Perez Diaz) for telling us about the edibility of this plant. How many plants of Mesoamerica can provide latex? to make ballgame balls that bounce? We all know that Castilla elastica is the primary source of rubber for the Olmec, Maya, Aztec and everyone else in Mesoamerica. But how many other plants provide latex that can bounce when “vulcanized” by being boiled with appropriate chemicals? We are working with the park administration teams in the diverse eco-systems of Parque Nacional Yaxha Nakum Naranjo, Peten, Guatemala, to find all edible and utilitarian plants available for the Mayan people over thousands of years. We have already found THREE DIFFERENT plants, growing at Yaxha, that provide the chemicals to coagulate the latex of Castilla elastica (in other words we have found a lot more than just Ipomoea alba which is literally “everywhere” if you take a boat cruise around Lake Yaxha (the plant grows along the shores all the way around). I just found mention of additional coagulating plants that we will now look for on upcoming field trips (so at least a fourth coagulating chemical option). Plus, I have stumbled upon indication of possibility of two additional plants that can provide functional rubber for making ballgame balls (when treated with chemicals from the other plants). Even more to my surprise, these two additional “possible rubber plants” are both findable in the Yaxha park. We have found one already but did not know it could produce rubber since this plant is not mentioned in one single book on Mayan ballgames). We have found the other but until it flowers we will not know its Genus and species. However we will try to identify it by its leaf size and shape. This lecture will be in two parts, the same evening. One presentation by Nicholas Hellmuth, Then a presentation by Maria Antonieta Cajas. Both on patolli games. The two speakers will cover the patolli of the Maya, Teotihuacan, Tula, Mixtec and Aztec, and elsewhere of Mesoamerica. Dr Nicholas Hellmuth will discuss the iconography of aspects of patolli that were not illustrated in the several excellent articles, monographs, and dissertations on patolli games in the last 40 years. 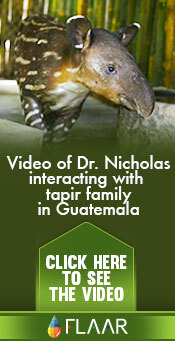 Nicholas’s experience with patolli is over half a century: at age 19, in 1965, while a Harvard student working for the University of Pennsylvania project at Tikal, he discovered a patolli game board in a palace he excavated adjacent to Temple I. His MA thesis was on Teotihuacan influence on Mayan art and iconography. His PhD dissertation was on plants, animals, and reptile iconography of the Surface of the Underwaterworld. We will document what creatures were inspirations for the shapes of the eccentric variations of patolli game boards. This lecture will document the relationship of Patolli to astronomical symbolism. Plus we will suggest that aspects of the ballgames of Mesoamerica may have relationship with some aspects of patolli symbolism. 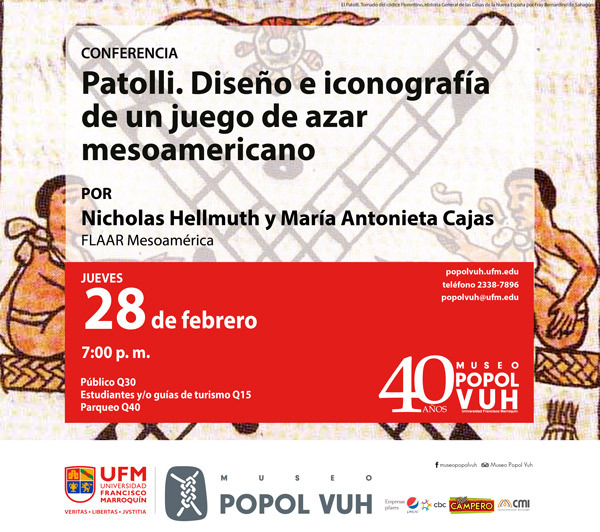 The Hero Twins of the Popol Vuh played patolli when they were kids, so this is an appropriate lecture for the Museo Popol Vuh. The lecture will be in Spanish but we can answer questions in English and Deutsch as well. Plus if you wish this lecture in your own museum, university, social group in English or Deutsch, you can fly us to your city anywhere in the world. Is Yaxha also a word for Mayan rubber tree, Castilla elastica? I always assumed that Yaxha or Yaxhá was derived from Yax (blue or green) and há (water). But today, while doing research on wild edible roots of the Mayan areas, I did a search for the plant I was looking for at Yaxha: what I got instead was a paragraph that seemed to indicate that Yaxha was a native word for Castilla elastica! I do not believe they are using the word Yaxha to indicate a location since it is in the first sentence and in italics, same as Kiikche. Castilla elastica Cervantes. Rubber tree. Ule. Yaxha, Kiikche (Yucatan, Maya). A medium-sized tree of lowland forest; Mexico to Honduras, and perhaps farther southward. Noteworthy for its large flannel-like leaves, drooping on each side of the branches, and for its large, bright-red, showy fruits. Castilla trees are the source of Central American rubber, and most of the larger individuals seen either in the forest or in cultivation bear large, oblique gashes on their trunks that show they have been tapped. Attempts at cultivation of the tree on a large scale have not proved profitable. The wood is pale brown, light, fairly soft, not strong, perishable; not utilized. (For description see T. of T. A., pp. 128-130.) (Standley and Record 1936: 110), The Forests and Flora of British Honduras, Field Museum of Natural History, Publication 350, Botany, Vol. XII, a free download on the Internet. Now I Google ule “Yaxha” and get Elsevier's Dictionary of Trees: Volume 1: North America, by M. M. Grandtner, and on page 171 it lists the word yaxha as a word for Castilla elastica in Mexico! Next step is to go back in history and make sure that all earlier historians and ethnohistorians focused on the best known meaning: blue-green water. Then go deeper into the linguistic aspects of hule (ule). But I am frankly flabbergasted to find that Yaxha is a standard word for rubber of Castilla elastica, especially because with the help of park ranger Teco (Moises Daniel Perez Diaz) we have found three Castilla elastica trees and Merremia tuberosa. Q’eqchi’ Mayan plant researcher Senaida Ba have also found Ipomoea alba (which “vulcanizes” rubber as long known by Tarkanian). And I photographed flowers last week between Yaxha and Nakum that Elena Siekavizza was able to identify as Merremia umbellata, which has chemicals in the vine that can coagulate “vulcanize” latex from Castilla elastica. So the Parque Nacional Yaxha Nakum Naranjo has four of the major components to produce Mayan ballgame rubber balls: the rubber tree and three different plants for coagulating the latex. Great discovery by the joint teams of FLAAR Mesoamerica and the park teams. We will be sharing all this with Michael Tarkanian of MIT, as he is a world-recognized chemical expert in “vulcanizing” rubber the way the Olmec, Maya, Aztec and everyone else did thousands of years before Thomas Goodyear. Our project at Parque Nacional Yaxha Nakum Naranjo is to make annotated lists of waterbirds, other birds, mammals, etc, and also all edible and utilitarian plants usable by the Classic Mayan people 2000 years ago. Plus to show the entire world the majesty of the Neotropical rain forests, lakes, rivers, and lowland areas around Yaxha, Nakum, Naranjo, and Topoxte Island. Here is a view inside the main acropolis at Nakum: lots of temples, lots of pyramids, and palaces lining several levels of the pyramids. If you want to see lots more monumental acropolises, multi-storied palaces, and endless number of throne rooms in these palaces, be sure to try to get to Naranjo (walkable from Yaxha if you have time and strength for about 20km hike in and 20km hike out) or (high axel 4WD-drivable from Melchor de Mencos (border town facing Belize). For documenting the majesty of the jungle as well as for showcasing the pyramids, temples, palaces, and acropolises, panorama photographs are very helpful. Although our present focus is on plants, animals, and the diversity of eco-systems, the park administration team has asked that since we have high-resolution camera equipment, that it would help if we also do panos of some of the pyramid-temples, palaces, etc. So in November Maria Alejandra Gutierrez (FLAAR Mesoamerica) began using our GigaPan digital system in Grupo Maler. And in December she returned along with Roxana Leal and Sebastian Molina (also FLAAR) to do additional panoramas, including of Topoxte Island (since this was one of the requests by the park). Panorama view of one part of the Post Classic Mayan temples of Topoxte Island, Lake Yaxha (Parque Nacional Yaxha Nakum Naranjo). The late structures here have features comparable to Chichen Itza and Mayapan, of Yucatan. Gradually we will be adding additional panorama equipment and exploring the virtual reality applications. But to start with we continue to use the GigaPan and the L-shaped accessory by Bogen 3288 (Manfrotto 340) on top of a Manfrotto 303PLUS panoramic photography tripod head. An L-shaped accessory allows you to easily take a higher panorama (since if your camera is only horizontal you need a wide-angle lens, which distorts the subject). If you have an L-shaped tripod head (on a panorama tripod head) then you can attach your camera vertically and get much higher resolution with noticeably less distortion. We will also be doing panoramas “inside the jungle” surrounding the ruins, especially the corozo palm eco-system, the Aechmea magdalenae eco-system, the native Guadua bamboo eco-system (along Rio Holmul) and all the other eco-systems around the park. Mushrooms as a source of colorant for the Classic Maya? All Mayanists know mushroom stones and the Aztec delight in hallucinogenic mushrooms (species which do not grow at Yaxha). We know this because Professor Lowy came to Yaxha to look for hallucinogenic mushrooms in the 1970’s while I had the mapping project (so we had facilities for visiting scholars). Of course he found only the mushrooms which were visible the month when he visited. 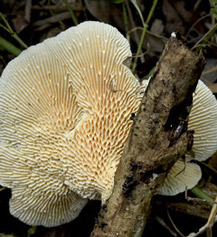 But there is no evidence that any mushroom at Yaxha is hallucinogenic. The FLAAR team is back at Yaxha after 44 years; this time we are working on plants, animals, mushrooms, and lichen. While doing research on lichen I was surprised to learn that mushrooms and lichen can also be a source of colorant. We do a field trip once a month (because there is not strong enough Internet and because electricity from solar panels is not (yet) strong enough to power our batteries, we can stay only about 5 days per month. We hope to be able to improve Internet reception and electrical power as soon as donations are available, so we can stay and do even more research in this remarkable botanical park. If you or your company can help, please let us know. Lots of species o mushrooms were edible; these are easiest to find. To figure out which Maya mushrooms are sources for colorants will be a challenge: but that is what keeps me interested in learning more. The range of the colors of the mushrooms we have found so far at Parque Nacional Yaxha Nakum Naranjo is impressive. However this year was extremely dry; if it rains more next year we can f ind even more colors. So no blue mushrooms at Yaxhayet, but blue mushrooms do occur in nearby Belize. 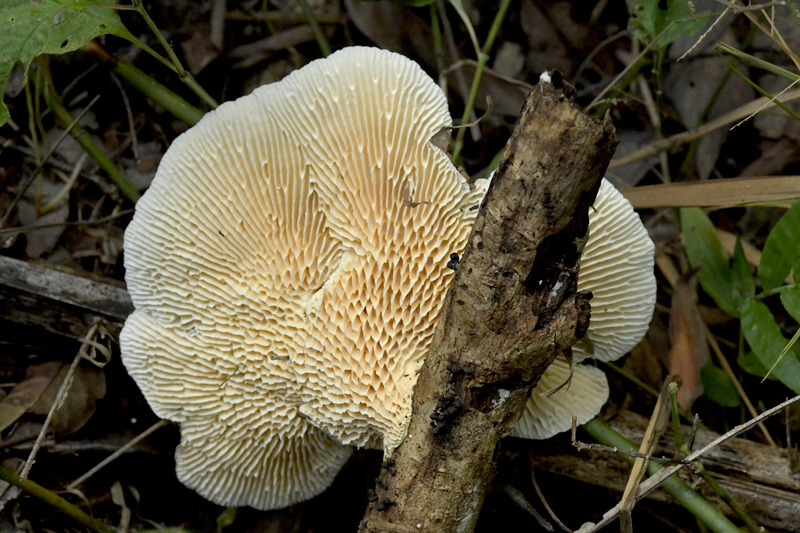 After lots of research I learned that the most common mushrooms at Yaxha are sources of colorant for the Mayan people for thousands of years. But... there is another mushroom which looks identical on the top. So to be sure you have the colorant-capable mushroom you have to turn it over to see the structure on the underside: these Yaxha mushrooms are all colorant capable!